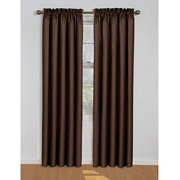 Blackout Drapes: Save on Electricity! So in researching ways I can save money on my energy bill I came across people mentioning blackout drapes. Now I live in an apartment approx. 890 sqft and two rooms are VERY sunny! Not to mention I’m in Texas where the heat will kill ya. I have branchy trees in front of my windows, a nice view and always kept sheer curtains and my blinds open to enjoy the view. MISTAKE!! Now that I’m thinking about it, I’ve been wasting so much money and it really bothers me. So my next triumph is to purchase blackout drapes. Walmart has what appears to be nice ones on their website. They are advertised as energy efficient and are sold by the panel. Upon further reading I discovered they have bundles!! Normally $9.97/panel, buy a bundle of 4 panels and save $5.00. Previous PostAmerican Chop Suey = 3 meals for Less than $4!Next PostPorch Redo: Recycle and Reuse!